Everything starts when Jughead’s dog, Hot Dog, is run over by a careless driver at night. In horrified desperation, arrives at Sabrina Spellman’s house at the Witching Hour, the most grimly auspicious hour for magic, and requests Sabrina and her aunts to do what they can for poor Hot Dog. The diagnosis however, is bad. Hot Dog was dead on arrival and there is nothing that Hilda and Zelda can do for him. The subject of necromancy is raised and the two Spellman sisters react strongly against the suggestion, for it is a dark and dangerous magic that should not be trifled with. It doesn’t work out like that of course, in the end. For just as much as Juggie loves Hot Dog, Sabrina loves her cat Salem. And then follows a morbid plot as the zombie contagion spreads through the cheery town of Riverdale. Reading through this issue, I got the creeps with every sing page. A good horror movie, in my estimation, is one that starts off a bit slow and then gathers momentum as it progresses, until finally things come to a head in the climax. Roberto Aguiree-Sacasa writes a very strong issue where he displays that he absolutely does get all these characters, that he understands them inside out. But also, he is going to do a number on them too. This is a zombie story after all, so we can expect to see some of these characters come back as zombies. I got goosebumps just reading through and while I’m looking forward to the second issue next month, I’m also really tense because these are characters I love for their cheerful enthusiasm most of all, their pranks and their zest for life. And yet, to see them suffer like this, given the final page of the issue, I almost can’t bear it. Isn’t that what this title is about in the end though? Roberto has taken some familiar characters, spun them into a new and darker Riverdale, and there’s no looking back. The story moves ahead with a brisk, almost brutal pace, and there’s no letup in the action at all. And the story hits home in the guts when poor Hot Dog comes back as a zombie. I remember the this one dog who used to eat more than Juggie, who used to chase cars on the streets, who was pretty much a dog version of Juggie, and was one of the most lovable of all characters in a series full of such characters. And now he’s a zombie. Almost enough to make you cry. Of course, this issue would not have been so freaking amazing if not for the mind-blowing art by Francesco Francavilla. From the cover itself, we know that this isn’t our usual Riverdale and these aren’t are usual characters, within the context of the story, but even that cover and the first few pages don’t prepare you for the absolute brilliance that is in this comic. Everything is dark and the colours are all muted blues and oranges and yellows mixed in with black. When I’d first heard of this comic, I’d had no idea that it was going to be so grim. As a rule, I avoid looking at previews because I don’t like to spoil myself on my comics. So I was thoroughly unprepared for this brutal script, even more brutal with the art. Francesco’s art on Scott Snyder’s American Vampire Anthology #1 last month had been superb. On this issue, his art is beyond superb. There are words that could be said here, but none of them can really get across how good the art was here. Sure, sure, high praise, hyperbolic praise, right, right. But you know what, I definitely loved this issue. I’d never thought that I’d ever read an Archie comic like this. It was amazing on every single level. Frankly, I do want more. 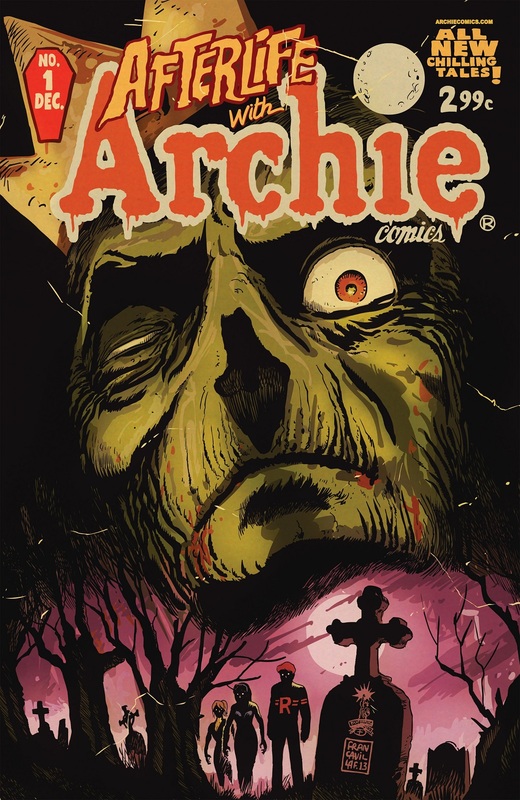 Afterlife with Archie #1 is my first Archie comic in some ten years, probably more, and this homecoming has been completely unexpected and… gut-punching. Posted on October 27, 2013, in Comics Reviews, Review Central and tagged Afterlife With Archie, Archie, Archie Comics, Comics, Comics Review, Francesco Francavilla, Horror, Jughead, magic, Review, Review Central, Riverdale, Roberto Aguirre-Sacasa, Sabrina, Suspense, Urban Adventure, Urban Horror, Witches, Zombie Apocalypse, Zombies. Bookmark the permalink. 7 Comments.